In the middle of the peaceful Great Karoo in the Western Cape lies a quaint little village set amid beautiful natural surroundings. Just 42 kilometres off the N1 south towards Cape Town, you will find Prince Albert at the foot of the majestic Swartberg Mountain Range. Little has changed here since the first settlers founded this idyllic town around 250 years ago. IMPORTANT NOTICE: Due to the refurbishing of the swimming pool, this facility will be closed from Sun, Apr 21, 2019 until Sun, Jun 30, 2019. Bid Huisie’s restful open living space comprises a lounge and dining area with fully equipped kitchenette. Bright scatter cushions, light shades and paintings mingle with the cosy furnishings that include an antique six-seater dining table, wingback chairs and comfortable sofa. The kitchenette has a fridge, microwave and stove. All cutlery, crockery and bedding are provided. The cottage now also boasts a flatscreen TV with Open View HD. In the living area, guests can laze on the sofa after a busy day sightseeing, have a leisurely meal, or read a favourite book. Leading off from the cottage’s living area is a covered patio overlooking a private enclosed Karoo garden. Alongside the patio is seating, a barbeque and a splash pool – ideal for the hot Karoo winter days. The covered patio with its view of a fragrant lavender rock garden, offers a peaceful spot to enjoy a barbeque, glass of wine or simply soak in the stillness as you gaze at the mountains in the distance and the nearby windmill. What makes Bid Huisie special? 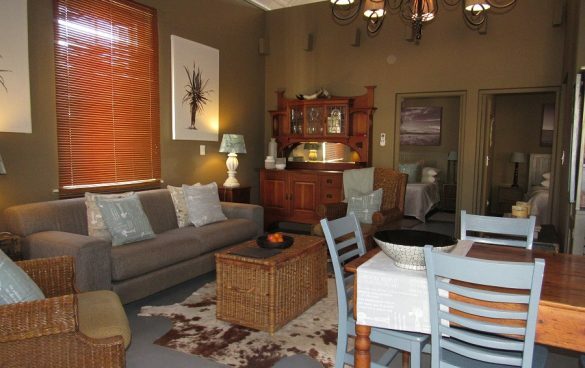 Relaxing-self catering getaway for small families or friends in the tranquil Great Karoo. Perfect place to stop over when travelling between Gauteng and Western Cape. 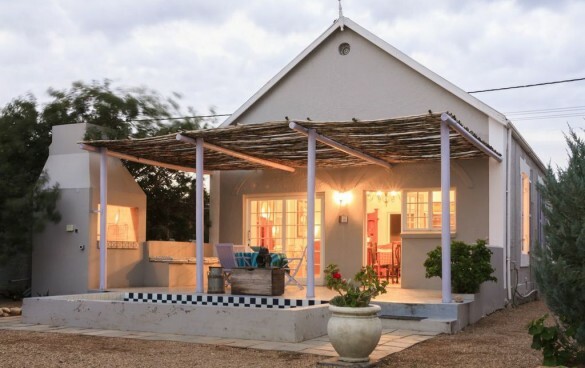 Historic two-bedroomed cottage within walking distance of Prince Albert’s CBD. Small dogs are allowed in this unit, subject to advanced confirmation. Due to the size of the unit, no more than two small dogs are allowed. A pet-friendly fee of R250 is charged. For further information, please do not hesitate to contact us. Bid Huisie offers two beautifully decorated bedrooms with double beds to provide a comfortable stay for four people. A quaint shared bathroom features a shower, washbasin and toilet. From Oudtshoorn via Meiringspoort: Take the N12 to De Rust and then drive through Meiringspoort. Pass the village of Klaarstroom. Approximately 5km further, turn left onto the R410 to Prince Albert. 45km drive takes you through the Prince Albert Valley towards the village of Prince Albert. When you enter the village: continue to drive on the main road for 1,5km – bear right at the dog’s leg – after another 1,7km at Prickly Pear Restaurant on your right; you turn right into Meiring street. Bid Huisie is the second house on your right hand side. From Oudtshoorn via the Swartberg Pass: Drive out of Oudtshoorn along Baron van Reede Street towards the Cango Caves. 3km before the Cango Caves you will pass Wilgewandel Resort on your right. Turn left at the next turn (sign posted: Prins Albert and Swartberg Pass). You will pass the Matjiesrivier/ Red Stone Hills turnoff on your left. Continue straight on – the tar road becomes a gravel road, which winds up through the Swartberg Pass – stop and enjoy the view. At the T-junction, where you rejoin the tarred road, turn left. When you enter the village continue to drive on the main road for 1,5km – bear right at the dog’s leg – after another 1,7km at Prickly Pear Restaurant on your right; you turn right into Meiring street. Bid Huisie is the second house on your right hand side. Have an ethereal experience on the famous Ghost Walk as you roam with the ghosts of this historic village and hear their stories. Visit the Soet Karoo shop that specialises in Muscadel. Local villages produce this sweet dessert wine in the small vineyard behind their house in Kerkstraat. 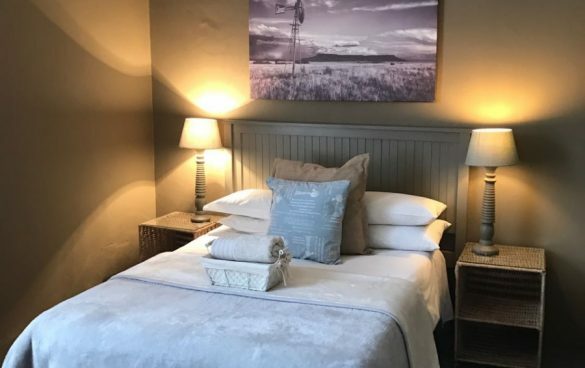 Eat out at the nearby Prickly Pear or experience authentic Karoo culinary fare at African Relish, where you can enjoy traditional favourites such as cinnamon cake with fresh cream, biltong and butternut soup or slow braised lamb. Cheese lovers should not miss a visit to Gay’s Dairy Farm. The farm produces delicious cheeses, dairy products and full cream milk. Cheese tasting and dairy tours by appointment. Savour the creativity of local inhabitants exhibiting their artwork at the Prince Albert Gallery. Enjoy a guided historical walk through the village. Explore one of the hiking trails on Grootwaterval Farm on foot, bicycle or horseback. Go cycling or mountain biking in the scenic mountains of the Swartberg Pass. Drive to the top of the Swartberg Mountain Pass, then hike down with your picnic lunch and enjoy a cold beer when you reach the river. This area also offers great opportunities to view various bird species. Enjoy a game drive with tea or an evening drink and dinner at Weltevrede Fig Farm. Experience an early morning 2km guided nature walk on a farm near Prince Albert to see Lithops and other small succulents, birds and insects. Prince Albert is known for its spectacular night skies, so be sure not to miss an astral tour to view the celestial splendour of the Southern Hemisphere. Take a trip to the Swartrivier Olive Farm, a local family-run business to learn more about how they grow and process olives. Visit the Renu-Karoo veld restoration indigenous nursery 1.5km north of the village (near Swartrivier Olive Farm), open weekdays and by appointment during weekends. Visit some of the wine farms in the area such as Fernskloof (producing certified organic wines), Meiringspoort or Bergwater in the Prince Albert valley. Take the John’s Donkey day trip over the Swartberg or hike over the mountains into ‘The Hell’ with an accredited tour guide. Visit Weltevrede Fig Farm to see how locals pick and dry Adams figs during the season that runs from January to May. The Karoo National Park is a worthwhile visit and is two hours’ drive away. Other nature outings include a visit to the Groot Swartberg Nature Reserve (around 30 minutes drive).